16 Festivals in Singapore: Experience the Multi-Ethnic Culture! Singapore is a country where 'east meets west'. The Lion City's culture is vast, as it includes both Asian and European cultures. Singapore has many areas divided by ethnicity of people like Little India and Chinatown. Singapore is beautiful because of its cultural diversity, a fusion of cultures and its social harmony. Singapore's culture is so vast that the country has four official languages. Being a peace-loving country, it has attracted many immigrants over the years due to its full respect for human rights and equality. Therefore, there is no doubt that there are many events and festivals in Singapore that are celebrated with zest and zeal. Pongal is a four-day period festival, which is celebrated widely in Southern India. The Indians in Singapore also celebrate it with grandeur at the beginning of the auspicious month of Thai. This festival is celebrated as a thank you to the sun god, Surya, for the harvest and the riches of the life. During Pongal, Little India is lit up with various events and competitions. People also exchanged gifts and wear new clothes during this festival. When: Pongal is celebrated every year from January 14 to January 17. What to Experience: Visit little India where some streets are turned into small villages with streak of stalls. Catch a glimpse of cultural dances and pongal cooking competition and visit the Sri Senpaga Vinayagar Temple. The first day of Chinese New year falls on new moon day between January 21 to February 20. The Lunar New Year is of great significance to the Chinese. The spring cleans their homes to get rid of the bad or the ill fortune and make way for good luck. The celebration continues for 14 days starting on the eve of the New Years. During this time, they visit their families and decorate their homes with red and gold colours. They also exchange gifts and give kids Hong Bao (red envelopes). The Chinese New Year is also referred to as the Spring Festival. The Chinatown comes to life through the celebration of festivities. Lion and dragon dances performed as a part of the celebration. 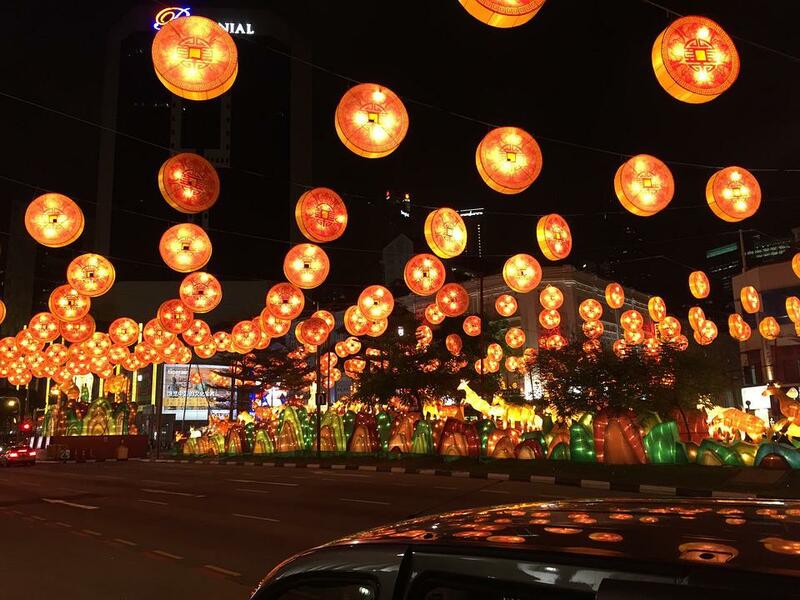 What to Experience: Head out to Chinatown where the street light up is famous along with the performances by the Lion dancers and Fire eaters. Don't miss Singapore's version of carnival called the Chingay Parade. Thai is a month in Tamil calendar, and Pusam is the name of a star. During the month of Thai, Pusam star is at its highest point in the sky. The festival is celebrated during a full moon day. In Singapore, devotees walk from Sri Srinivasa Perumal Temple to the Sri Thendayuthapani Temple. The celebration is of two days, the eve of the day, and the day itself. It's a festival for devotees to fulfil their vows. Some devotees carry spiked Kavadis (altars) that pierce through their torso. Other devotees carry pots of milk that are later poured over the Vel (a divine javelin). When: Thaipusam usually falls around the end of January. What to Experience: Join the annual Kavadi Procession from Little India where it starts. Visit Sri Thendayuthapani Temple and Sri Mariamman Temple. Lantern festival or the spring lantern festival is the most popular festival in SIngapore. It marks the last day of celebration of the Chinese New Year (15th day). During this day, the kids carry paper lanterns outside, lit them up and release it in the sky. Some paper lanterns are simple and traditional whereas some are of different shapes and sizes. Some even have quizzes on them for the kids to solve. It's a magnificent sight to see several lanterns light of the night sky. What to Experience: Visit Chinatown for the thousands of Lanterns decorated in the precinct. Enjoy the performances in the Moonfest Chinese Arts Festival. Savour the delicious Mooncakes to get the taste of the festival. Vesak Day is celebrated all over the world by followers of Buddhism. It marks the enlightenment and death of Buddha. During this day, devotees are often found meditating and doing a significant amount of charity work. This day also allows people to self-reflect. Vesak day falls on the full moon during the month of Vesak. When: Vesak day is generally during the first two weeks of May. What to Experience: Visit major Buddhist temples like the Lin Shan Shuang Lin Temple, Buddha Tooth Relic Temple, Sakya Muni Buddha Gaya Temple and many more. Don't miss the ritual of Bathing the Infant Buddha. The Dragon Boat Festival (also known as Duanwu Festival) or the Zhongxao Festival is a cultural festival of China that originated thousands of years ago. The festival is also called the Double Fifth Festival as it falls on the fifth day of the fifth month of the Chinese calendar. During this festival, dragon boats compete in races all over the world where Chinese communities are present, including Singapore. The boats compete at the Bedok Reservoir. People consume rice dumplings (zhongzi) and realgar wines during this day. When: The festival usually falls around the end of May to the first two weeks of June on the English calendar. What to Experience: Catch all the action of the races in Bedok Reservoir and DBS Marina Regatta. There are fun games to keep you occupied and enjoying before the race. Hari Raya Puasa marks the end of Ramadan - the month of fasting by the Muslims. Hari Raya Puasa means 'The day of Celebration'. During this day, people visit the mosques and then the graves (to greet any family that passed away). People wear new clothes and visit their families. Muslims also recite takbir in mosques in the evening. Oil lamps are also lit up. The festival symbolises purification and renewal of an individual. When: Hari Raya Puasa is generally in June. What to Experience: Get to experience the extravagance of the delicious food in the Geylang Serai Bazaar. Catch a glimpse of the ritual of breaking the fast near the Sultan Mosque. The National Day of Singapore is one of the favourite festivals in Singapore. The day is celebrated by holding a parade, followed by choreographed dances and much more. Every Singaporean takes pride in their country, people and their harmony. 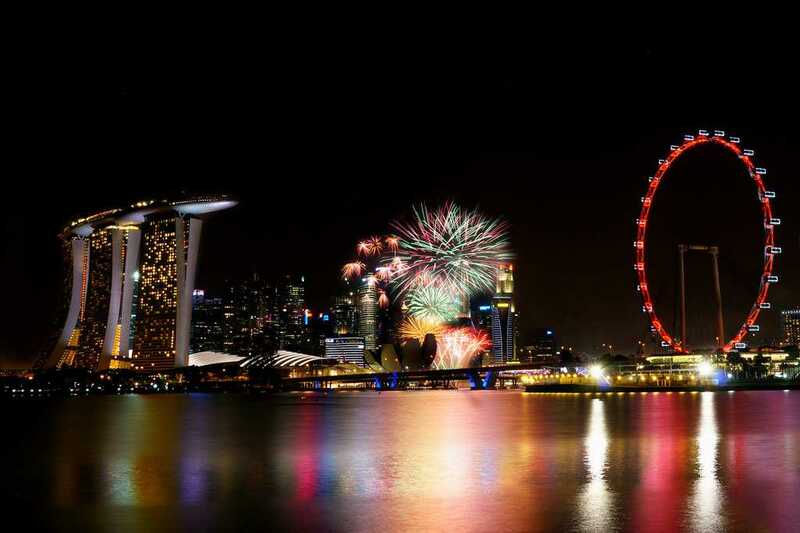 What to Experience: Be a part of the National Day celebrations at the Marina Bay or view the fireworks from the Singapore flyer. Don't forget to get your 'Funpack'. Deepavali or Diwali marks the day Lord Rama returned to his kingdom. It signifies victory of the good over the bad. During this day, Little India is lit up with lights and the skies are filled with dazzling fireworks in the night. People wear new clothes and greet each other. Before the day, some families clean their houses and make new purchases. When: Diwali is usually during the last week of October or first week of November. What to Experience: Join the celebrations and pujas during the festival at Sri Veeramakaliamman Temple, Go on a Diwali Shopping Spree in Mustafa Centre and the Festival Village. Hari Raya Haji symbolises sacrifices made by Ibrahim (willingness to sacrifice his first-born). Volunteers from the mosque sacrifice goat, sheep and cows. One-third of the meat is given to the ones in need and the rest is given to the family of the people who offered the animals for sacrifice. When: Hari Raya Haji usually falls on the last week of August or first week of September. What to Experience: Join the faithful in making the most out of this spiritual festival. Visit Mosques like the Sultan Mosque, Hajjah Fatimah Mosque, etc. Spend the evenings with friends and family over a meal. The Ghost Festival is a festival celebrated by the Buddhists and the Taoists on the 15th night of the 7th month of the Chinese calendar. It is believed that the ghosts come out during this period from the lower realms. During this day, people visit the graves to meet their ancestors and deceased members of the family and offer them food. Offerings are made to the spirits of the deceased to take care of their materialistic needs even in their afterlives. It is said that the ghosts make mischief if they are ignored. What's unique about the ghost festival in Singapore is that there are many entertainment sources available for the people. Large tents are set up during the festival, and many live performances are also conducted. The festival is also called Zhongyuan Festival or Yulan Festival. When: The festival is celebrated between the last week of August and the first week of September. What to Experience: Take the Birth, Life and Death Tour in Chinatown, take a Tour with the Asia Paranormal Investigators (API) and visit the Lorong Koo Chye Sheng Hong Temple to witness the festivities. The crowd of Singapore majorly consists of students and youth. Hence various festivals and events observe overwhelming participation. Singapore holds many significant events every year for everyone to indulge in. These festivals of Singapore are of high standards and are famous worldwide. Many even visit Singapore during events like the International Festival of Arts, Food Festival and Grand Prix. Singapore Art Week is a 12-day event that takes place every January. It is a celebration and a display for the lovers of visual arts. The event is held across multiple venues in Singapore. The event contains various exhibitions, numerous artworks, gallery openings, public art walks, lifestyle events and workshops. This is surely one of the festivals in Singapore that you must not miss. For a whole month, Singapore holds the International Festival of arts, which truly is a celebration for every artist and every person who enjoys and appreciates art. The festival has many shows and performances in different art forms using various technologies. The SIFA (Singapore International Festival of Arts) holds an event; a pre-festival called the OPEN which then connects the best artists/participants to SIFA. When: The Festival is usually held at the end of June. Indulge in the authentic local food prepared by expert chefs that will leave a heavenly taste in your mouth. The month-long festival consists of various competitions and different cuisines. The festival also has many workshops for hands-on learning. The food festival is organised by the Singapore Tourism Board and is recognised throughout the world. Singapore Night Festival brings out the best of the city with its heritage sites adorned with colourful lights. The Night Festival takes place on two weekends every August. Bras Basah Bugis is an art enclave in Singapore's civic centre that comes to life during the Night Festival. Watch international artists performing their original works on the streets. Some areas become only a pedestrian area to allow the festival to take place. The SNF (Singapore Night Festival) has a different theme every year, according to which the artists are chosen and decorations are selected. It's an event not to miss if you're in the city during August. Yes, you heard that right. Grand Prix Season held during September, is the perfect place to be to enjoy the thrill and to feel the rush. The fun is both on and off track. The Formula 1 race championship takes place through the city. Support your favourite to cheer for them. Post racing, there are many concerts and parties held. Grand Prix Singapore attracts many island dwellers and foreigners as well! Apart from these festivals, the folks also celebrate other religious festivals, pertaining to their religion. Majority of people in Singapore celebrate Christmas and New Years. The multi-ethnic community takes great pride in celebrating the many festivals of Singapore. What To Wear In Singapore - Things You Must Carry! Horse Riding in Singapore - 6 Riding Clubs to Gallop into Glory!